Flaky Tart is a delicious bakery conveniently located in my own back yard, Mount Pleasant Village. Lisa took over Flakey Tart in 2008. She is an established baker previously from The Cupcake Shop just north of Yonge and Eglinton. The bakery had not gone through a brand update in years and the brand that Lisa inherited did not correctly reflect the spirit of the little bakery. Lisa needed something she could take with her to bake sales to properly represent her brand as well as updating her business cards and storefront. I created a new logo for Lisa that would better represent her brand; warm and cozy little bakery that creates delicious and delightful treats. We had her logo printed as a sticker that she could use on packaging to take to bake sales and use on merchandise in the store. The first time Lisa displayed her new logo at events she recieved tremendous reviews! 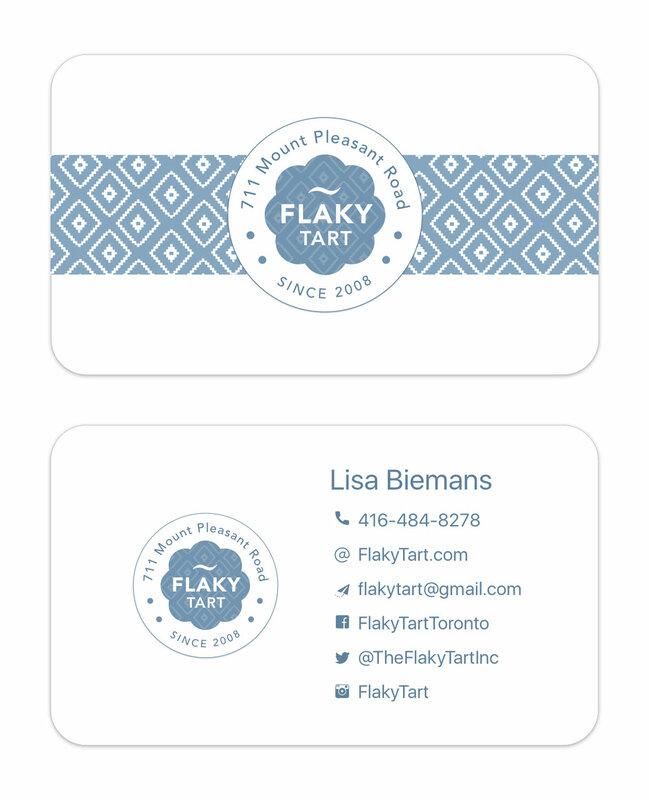 Lisa's new logo and business cards are a representation of all of the features Lisa used to decorate her bakery and the playfulness of her cakes and cookies. Lisa's front window was outdated, messy and used the old logo. She needed something clean and fresh that incorporated the new logo and the spirit of her bakery. Here is an picture of her winter window display with her new logo prominently on the window and contact information below.